Team DroneBase gets to interact with hundreds of drone pilots every single day. Our conversations with our pilots tend to be very tactical: training for a new vertical, clarifying mission plans and flight best practices, and spirited debates over price and cost. While these tactical conversations are important, I think it is important that drone pilots also understand what DroneBase is trying to build, and why it matters for you. In a series of posts this fall, I will try to be as open and transparent as possible with all of you about what problem DroneBase is solving, how we are solving it, and why we care so much about making this happen for you. There is nothing to do with your drone. If you are in any way engaged with drones or this industry, you intuitively know this to be true. This is the common refrain from 80% of the hobbyist drone pilots we talk to: “I bought a drone. I took some selfies, I took some videos at the beach, I took some pictures on a hike. But I had nothing else to do. Now my drone is sitting on my shelf collecting dust, and I can’t remember the last time I used it”. While hobbyist drone pilots are the least-engaged by nature, but the exact same under-utilization problem exists for semi-pro and professional drone pilots as well. Semi-professional pilots may have been a slightly more engaged drone user who just got their Part 107. However, getting that first commercial flight: knowing how to market your services, pricing out various packages, having a solid flight plan, understanding the operational and compliance considerations, transferring data, presenting the outputs, collecting payment, etc. can seem incredibly intimidating and hard. 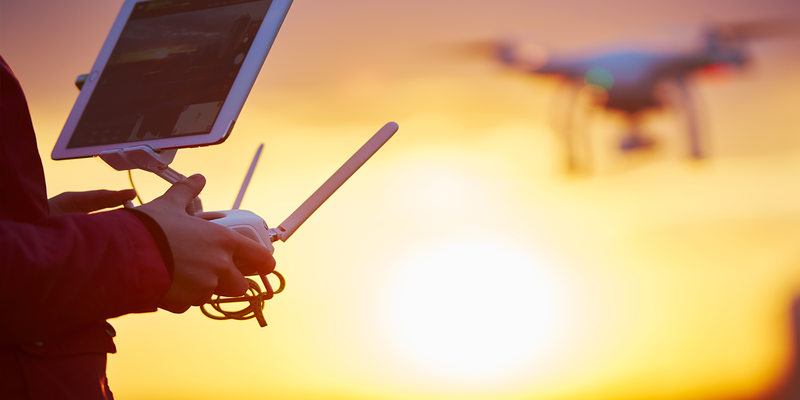 Full-time Professional pilots are the most engaged drone users, but the same problem exists: it is very hard to get a fully-booked schedule of professional drone flights. We have been very proud that DroneBase has been able to support drone pilots as full-time professionals just on our platform, or provide a percentage of work to entrepreneurial pilots who are working near-full time on their own. However, almost every full-time pro pilot we speak to is more idle in a given week than they want. Finally, even the enterprises and worksites trying to use drones themselves are woefully underusing their equipment. A construction site that flew a drone every single day would be considered a very heavy drone user. However, with one flight a day, that drone is being used 1.3% of the time, which would be considered wasteful for any other piece of equipment on the worksite. From our own data and internal industry studies, we estimate that the average drone gets flown about 6 times a year. That statistic should alarm our entire industry. If a product is used 3-10 times a year, it fits the profile of a GoPro: still a solid company ($1.3B valuation) with a nice-to-have product but with no real urgency to upgrade to the latest system. At the far other end of the spectrum, I check my iPhone about 100 times everyday: Apple is the most valuable company in the world ($813B), I am borderline addicted to their product and buying a new phone every other year is a non-decision. DroneBase believes that drones generally, and DJI specifically, may never reach iPhone level usage, but are far more profound than a GoPro. We do believe that DroneBase pilots can be engaged daily with their drone systems as essential tools for their professional, creative, and fun pursuits. Next week, I will lay out the Mission we're on here at DroneBase to solve this problem that there is nothing to do with your drone.